This was the ritual Dr. Usui used to perform to initiate the student in to Reiki during earlier days of his Reiki teachings. It is also called the traditional way of attunement and was repeated several times for each student. Originally, no symbols were used for attunement but gradually, with increasing awareness of Reiki, the number of Dr. Usui’s students also increased making it nearly impossible for him to continue with his traditional method. He thus started using Reiki symbols for attunement. It is said that out of his Master students, Dr. Chujiro was the first to receive Reiki symbols. Incidentally, Dr. Chujiro was also the last (16th) student of Dr. Usui trained to Master level. Dr. Chujiro passed on those symbols to Mrs. Hawayo Takata who was his last and 13th master student and also his successor. When Mrs. Takata started teaching Reiki, she passed on the symbols to her students but did not allow them to make written copies of the symbols. Consequently, different versions of symbols came up and so did the teaching and attunement methods. Currently used attunement method (with variations from teacher to teacher) is called the Western style of attunement. It is also most widely used. However, some Reiki teachers still follow the traditional method and empower the students through Reiju procedure. Reiju empowerment can be given only by those teachers who have been trained to do so. There are two main differences in Western style and traditional style. In traditional style, neither the symbols are used nor is the body touched. In the Western style, both things are done. Reiki symbols are used for attunement at every level and hands and top of head are physically touched and treated. The attunement effectively takes place both ways. 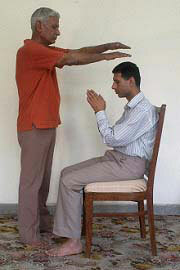 It is just that some Reiki teachers and even the students prefer one or the other method. I pass attunemnets through Reiju only on request.